Here's this week's sketch. I've done something a bit similar with the same visual elements. It's cool how moving something, like a group of 4 squares, can change the overall composition. If you're looking for measurements, I made my squares each 1 inch. I decided on making a little love card. I really like the brown with a pop of pink, it's fun! The colours are Soft Suede and Melon Mambo. Stamps are from Papertrey Ink (Heart Prints, Signature Greetings). OH MY GOSH, I love this! Can't wait to try it out! What a sweet card! I just love your sketches!! I love this card and your CAS approach. You've converted me from a quick and dirty to a clean and simple card maker!! WOW! LOVE, LOVE, LOVE this layout! It really is just gorgeous in its simplicity! Thanks for the inspiration! Gorgeous, so cute, love its sweet simplicity! Your site is a constant inspiration to me Natasha. Love the colours on this one. I just couldn't resist this sketch! The cards were incredibly inspirational too. Thanks! Great sketch!! I love these colors together too! lovely brown and pink...great sketch........love your postings here. Thanks for the inspiration! This is adorable! Love the simplicity of it...the colors are great! Adding CleanAndSimpleStamping to my list of faves! Thanks for the great ideas! I LOVE this sketch! It is just FAB and was so much fun to work with! What a fun sketch. Your card is cute and I love your colors. I played along and my take on this sketch is #43. LOOOOVE the sketch and especially LOVe the colors/papers you used. great card! so happy to see a Mr. Linky widget here! hope to play tomorrow! I couldn't stop...I had to make 2 cards with this layout and I knew I'll be using it more and more!! This is a great layout.. So many stampsets and patterned paper will work with this pattern. Thanks for your wonderful sketches. This was a great layout - lots of fun. Thanks! 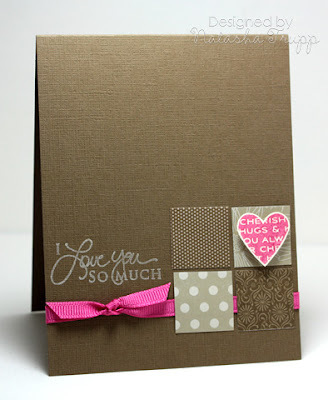 Love your card and layout! 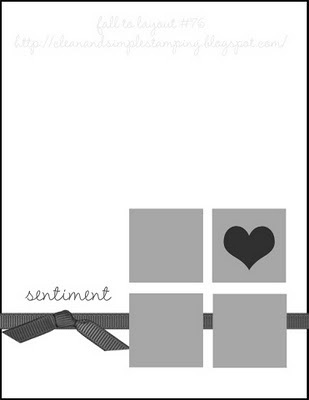 love this site...your layouts are great and make it so simple to create beautiful cards! I really liked this sketch and I made a second card on it. This time I used the squares. This card is for young chess player with the wish success. I love the simplicity of this layout. I will be using it make a bunch of much needed birthday cards. Love this sketch - I can see myself using it a lot. Thanks for the inspiration! Thank you so much for another clean and beautiful card sketch! I loved the little squares! So great! Excellent sketch! Loved using it and will keep this one in my folder for future cards! LOVE this sketch, will be using it again! I just discovered your blog! Thank you so much for this great sketch. I'll definitely be playing along every week. Wow... I just found your challenge blog and am thrilled. I will definitely be paying along every week - thank you for such inspiring CAS cards!